Looking for a entry level commercial snowplow? The Snowbear Model# 8826APBYS Winter Wolf Pro is designed for light commercial snow plowing applications. Priced to appeal to new to the commercial market, the Winter Wolf pro offers an 88 inch clearing width with a simple design to minimize complexity. 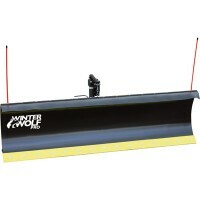 The reverseable polyurethane scraper edge and the powder coated finish add value to this light weight model. This entry was posted in snow removal equipment, snowbear, snowplow and tagged equipment, ice, snow plow, snow removal, snowbear. Bookmark the permalink. Prevent Ice Dams From Forming And Save Your House From Damage.